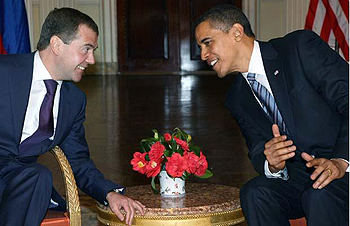 Russian President Dmitry Medvedev and U.S. President Barack Obama. By signing an MoU on economic issues with the European Union, Russia has moved all the more closer to joining the WTO. Despite the usual norm of 5 to 7 years required for a country's accession into the WTO, in Russia's case the negotiations have lasted for over 17 years and it appears that Russia will join in 2011. Presently, Russia happens to be the largest economy outside the WTO and the seventh-largest in the world. Russia applied for membership in the GATT (General Agreement on Tariffs and Trade) in 1993, but the negotiations remained half-hearted until Putin took the reins in 2000. The three years that followed saw energetic attempts to bring Russia inside the WTO, with several factors inching the country towards accession. The most important of them was the intellectual maturity in Russia regarding the benefits of joining the WTO among the internationally oriented Russian economists and politicians after they witnessed the importance given to China after it joined. Secondly, there have been structural changes in the composition of Russian exports. The share of raw materials such as oil and natural gas has come down (in percentage terms) as compared to that of intermediary goods such as metals and chemicals. As a result, the Russian steel industry has been consolidated with four of the biggest companies having a share of 80 percent in the total steel exports. But these firms face import quota restrictions from the European Union that would no longer exist after Russia becomes a member of WTO. The chemical exports face dumping penalties in the E.U. Lobbying by these newly affluent groups is the main factor behind Russia's increased efforts to join WTO. At this juncture, it would be wise to look into the benefits for both Russia and the rest of the world out of Russia's entry into the WTO. Russia is already a market economy, and so WTO membership does not signify sweeping systemic changes, as was the case with China. In spite of this, Russian entry into the WTO would, as mentioned earlier, lead to increased demand for exports of metals and chemicals, thus expanding these sectors. At the same time, manufacturers would have to compete on a level playing field with the rest of the world. This would dramatically improve quality and efficiency in these sectors. Russia has maintained its stand on having a huge gap between the price of oil and natural gas in its domestic market and for exports. Though there is an agreement on increasing the domestic prices in the long run to match the marginal costs of Gazprom, there is no immediate commitment to do so, thus not radicalizing the Russian public against this move. Surprisingly, the most significant effect (about 72 percent of the total medium-term welfare gains) will come not from improved market access but from Russia's own domestic liberalization of barriers to foreign direct investment in the business services sector (transportation, financial and telecommunications). Russian total WTO-way trade in manufactures could double from $187 billion (in 2005) to $352 billion (based on the Rose Gravity Model calculations). In addition to this, Russia will benefit from the security that comes from trading with other members on the basis of an established legal framework, and on the market access commitments of the existing members of the WTO. Russia will also be able to use the WTO's binding dispute settlement mechanism to resolve any disputes that might arise out of its engagement with the WTO. Thus, despite concerns from the agricultural and domestic manufacturing sectors such as food processing and light industries, which would face a stiff competition from imports if the economy is opened up, it is a fact that Russia stands to gain as a whole and Russian GDP is expected to expand by more than 3 percent by 2014. As the European Union is by far Russia's biggest trade partner, accounting for more than a third of all Russian imports and exports of goods, the European Union stands to gain greatly from Russia's accession to the WTO. In the first half of this decade, the West was understandably paranoid about the weaknesses in the Russian legal system due to its lack of transparency. But Putin's efforts bore fruit as a new tax and customs code were introduced and other state laws were brought to conformity with WTO regulations in 2003. Eventually, Russia underwent a paradigm shift in its trade relations as the United States, followed by the E.U., declared Russia a market economy, a distinction even existing WTO member China is yet to achieve. As of now, Western complaints about Russia are few, as Russia is already a free economy with average tariffs of a mere 11 percent. The West stands to gain considerably from this engagement as opening up of the booming Russian services sector, combined with the supremacy of the West in this area, would reap them huge harvests. The weak sectors in Russia, such as food processing and light industries, would serve as a huge market for U.S. imports into Russia. This also stands to foster better relations between the erstwhile Cold War enemies. The United States, however, would need to amend the Jackson-Vanik amendment of 1974 to reap the benefits of the opening up of the Russian market. Moreover, this is probably the best opportunity the West might get in assuming a role in defining the functioning of renationalized Russian enterprises such as Gazprom, Rosneft and Transneft, which dominate the energy sector. On the diplomatic front, the West can use this as a leveraging option to mediate and resolve the Russian embargo on Georgia and Moldova. Most importantly, it will enable the West to demand enforcement should Russia renege on its commitments to WTO. Being a part of WTO will also coax Russia to improve law and order, thus limiting corruption, which is good for both Russia and the world. As stated by European Council President Herman Van Rompuy, Russia's accession to the WTO "is a paramount step forward and a step the world is closely watching." It is a big win-win for both Russia, as a trillion-dollar economy that is literally next door to the vibrant economies of the E.U. and the WTO, which controls around 93 percent of the global trade.